For the first time in my career I took three consecutive weeks off. 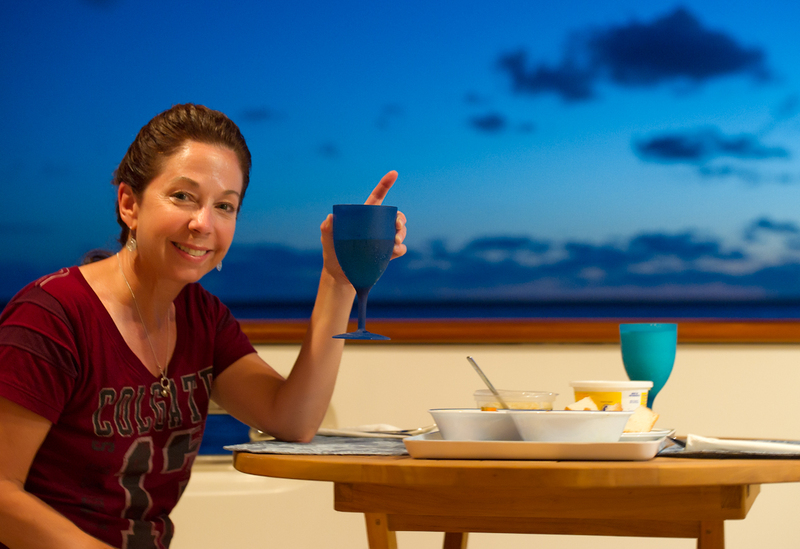 We knew we needed and wanted to take a shake down cruise and decided that early June would work. 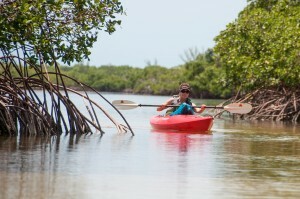 So we packed up our newly purchased kayaks into our pickup truck and once again drove to Ft Pierce FL. It is a relatively easy drive except for the Washington/Virginia corridor. I think every shovel ready highway project is taking place within 50 miles of the Capitol. We arrived on Sunday June 3 and spent Monday provisioning and getting the boat ready for a quick departure. 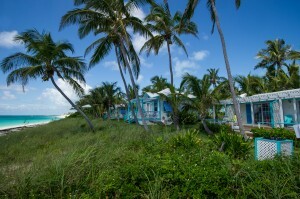 Our destination was the Abacos. We had not been there since 1985 when we chartered out of Hope Town. Our goal was to make it to Hope Town before time forced us to turn around. We decided to run outside down to Lake Worth and cross over from there to West End, Grand Bahama. The 50 mile trip down to Lake Worth was uneventful however we awoke Wednesday morning to a ferocious hail storm. 1/4 inch hail pelted the boat so we waited an hour for a break. The weather was not perfect and Miami radar showed severe thunderstorms looming. I made the decision to go calculating we would be ahead of the next round of storms. Turned out to be correct and we pulled into Old Bahama Bay Marina around 3PM. Storms passed behind us all day but nothing touched us. 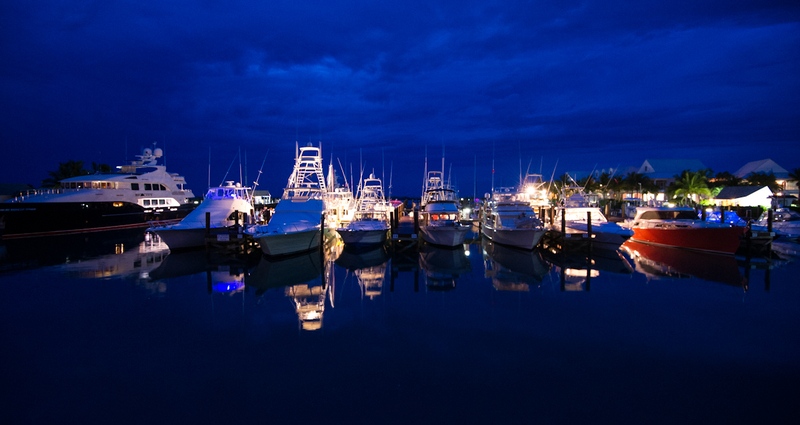 Old Bahama Bay Marina is an interesting story. Originally Jack Tar Marina it was renovated and the name changed about 2001. A developer by the name of Bobby Ginn envisioned a $4.9 billion master plan including 1400 single home sites, 4000 condos, two golf courses, and airport and many more amenities. Some 220 lots were sold between 2006-2008 when the bottom fell out of the world economy. Ginn sur Mer as it was called defaulted on a $675 million loan and the resulting fall out has kept an army of lawyers busy. Much can be read online. Our plan was to spend Wednesday and Thursday night at the marina and take off Friday. Unfortunately a cold front dropped down forcing us and others to sit tight at the marina and watch fierce thunderstorms and cloud to ground lightning pass West to East several miles north of the marina all day Friday. It was a spectacular show. The extra day did provide us some time to explore and we borrowed two bicycles from the marina and rode for what seemed like miles through the defunct development. Maybe a dozen homes were built but the infrastructure is in place providing a strange riding experience through empty neighborhoods. We finally got underway early Saturday morning. 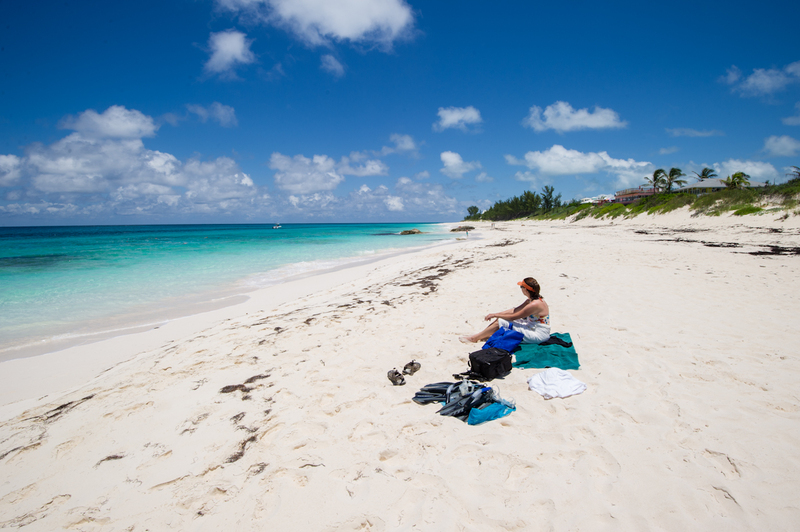 Our first stop was Great Sale Cay. While it is possible to cut off a few miles by taking Indian Cay Channel our 5’9″ draft and low tide forced us north to Memory Rock before we could turn east to Great Sale. We had a perfect run under beautiful blue skies and reached Great Sale mid afternoon. A phenomenon that occurs in the Bahamas quite frequently is what’s called “Fish Muds”. Our guide book says that a school of fish will gather, and while spawning, fan their tails near the bottom. This causes great clouds of sand and mud to become waterborne. 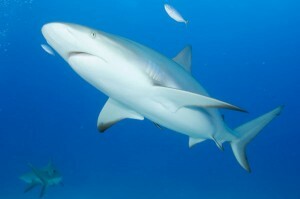 This creates a false impression of a sandbar or shallow area in the water. On our approach to Great Sale we encountered our first fish mud. We motored around it even though the chart indicated plenty of water. The fish muds can be a mile wide so it took some time to get comfortable driving through them. From Great Sale Cay we motored to Powell Cay arriving mid afternoon. 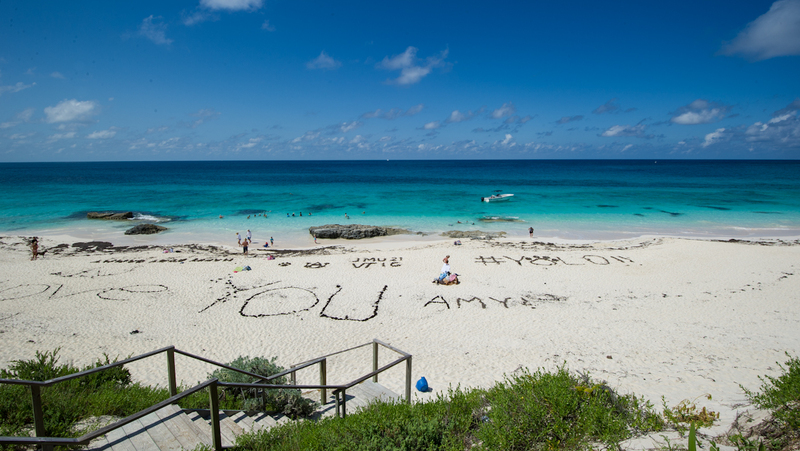 We anchored on the southwest side off a spectacular beach. We were the only boat and we immediately launched our new kayaks. I did not take any photos as I decided to use this kayak excursion to try out the GoPro video camera we had purchased on our way down to the survey last March. 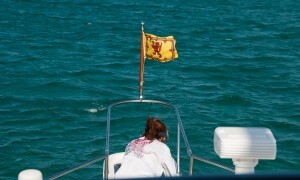 It is a superb little device and we had used it during our sea trial. I wish I could upload a video of the bluff we hiked at Powell Cay. 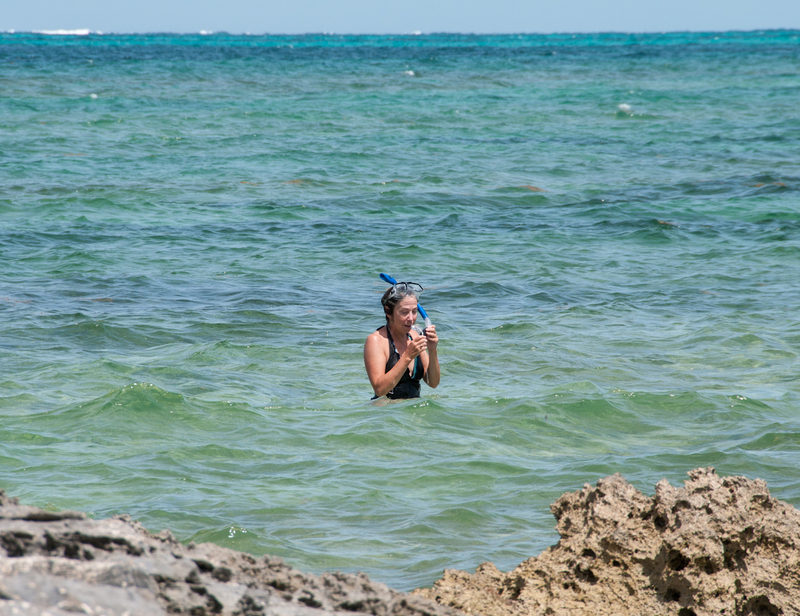 Unfortunately when we landed on the beach to snorkel I forgot to put the waterproof back on the housing and immediately fried the camera and SD card. An expensive, stupid mistake. I will replace it though. 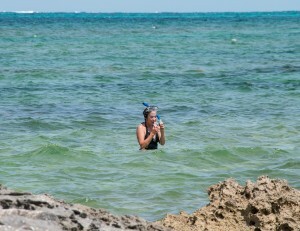 However the snorkeling was good and Cath ran into a reef shark prompting her to run from the water. 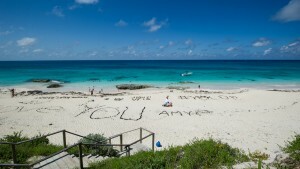 I did not see it but saw others during our trip as they are ubiquitous in the Bahamas. Below is a photo I pulled from the web. They can look scary up close under water. From Powell Cay we continued on to Green Turtle Cay a short 2.5 hour motor east. Green Turtle is home to the Green Turtle Club and Resort and also has a small town called New Plymouth. New Plymouth as two small groceries, a hardware store and importantly a large garbage bin at the public landing dock. We opted to have lunch at the Green Turtle Club and launched the dinghy for the short ride from the anchorage to White Sound Harbor. After lunch we explored Black Sound Harbor and Settlement Harbor eventually landing the dinghy at the town dock. Cath was desperate for an internet connection and we found one at the tiny public library. $2 for 10 minutes. Expensive I thought but it worked. From Green Turtle our next destination was to be Great Guana Cay. 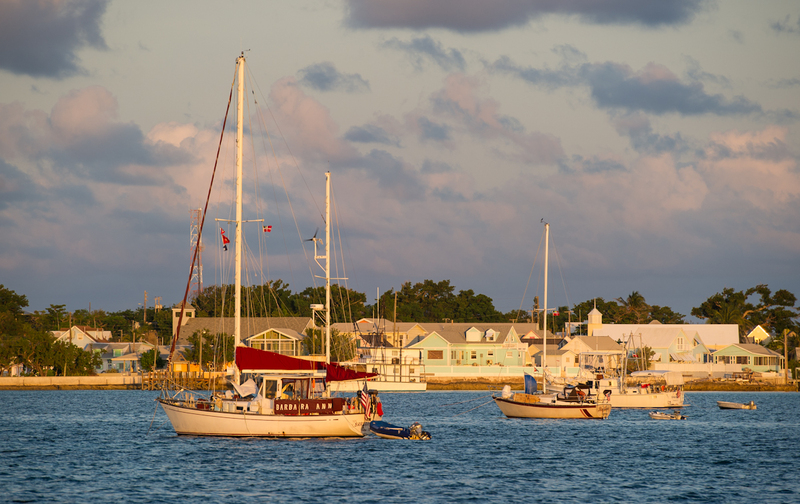 Although a short trip our route would take us through Whale Cay Channel out into the Atlantic and back into the Sea of Abaco through Loggerhead Channel. Whale Cay Channel or “The Whale” as it is called can turn quite nasty and it is important to watch and listen to the weather. Seas were calm for this first adventure through “The Whale” and we pulled into Fishers Bay less than three hours after departing Green Turtle. Fishers is a protected bay just west of Settlement Harbour. There is a pretty beach establishment “Grabbers Bar & Grill” but we had our minds set on Nippers Beach Bar & Grill. To get there required launching the dinghy and motoring around the point to the town dock in Settlement Harbour. Nippers is worth the effort if you have to swim to the town dock. 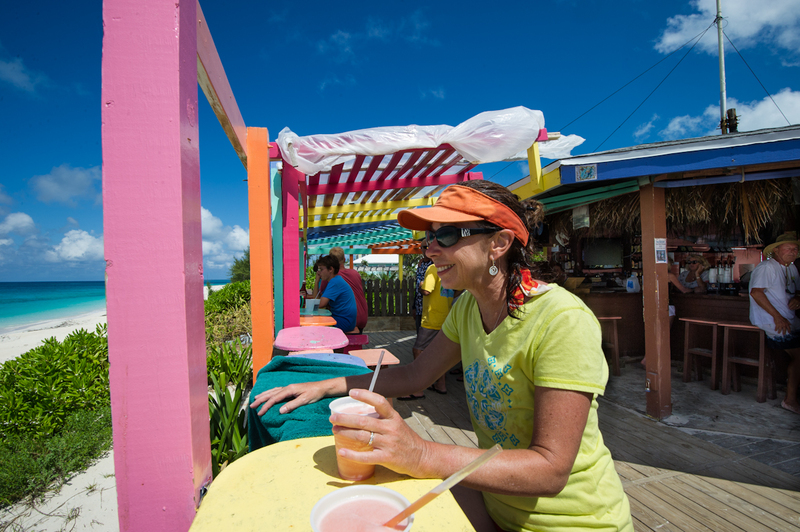 Nippers opened in 1996 and sits above one of the most beautiful beaches in the Bahamas. It is a short walk from the town dock and a very popular destination. We were told by several people that the Sunday pig roast can be a wild time. Nippers also makes a mean frozen concoction worth trying. We enjoyed the beach so the first day we decided to stay one more. Two days or 85 degrees and brilliant sun along with miles of beautiful beach is hard to leave. We needed some provisions so from Great Guana we motored to Marsh Harbor. I called ahead on the vhf to see if Marsh Harbor Marina could take us for a night and they said no problem. Since we had plenty of time to get there we dropped our speed to 4 knots and trolled with our newly purchased boat pole. We are not fisherman. We had tried several times at 8 knots but no luck. We got one although I have no idea what it is. The owner of Marsh Harbor Marina guided us in and helped us tie off. 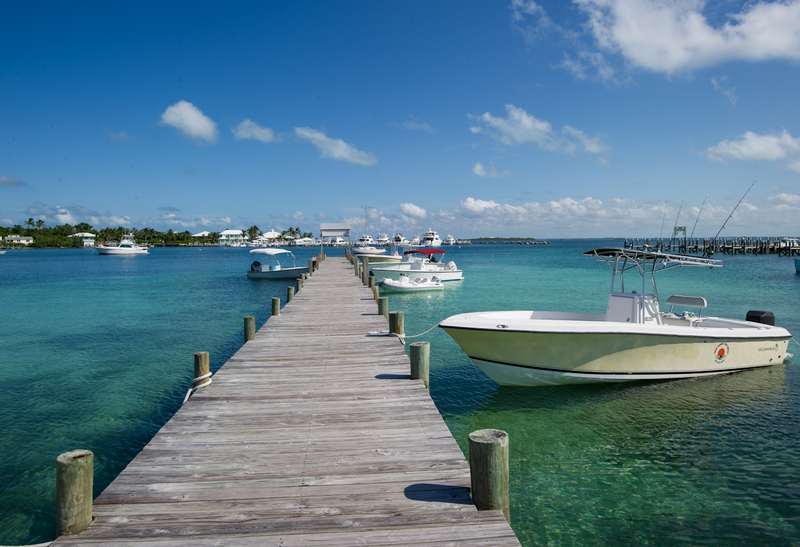 Marsh Harbor is the third largest town in the Bahamas behind only Nassau and Freeport. It has everything for the boater including, I was told, the largest grocery store in the Bahamas. Maxwells was located on the other side of the harbor so late in the afternoon we decided to walk around the harbor to find it. Big mistake. 95 degrees, high humidity and no breeze made the 1.5 mile walk unbearable. We found another smaller grocery and grabbed a cab back. The next morning I borrowed a bike from the marina and did find Maxwells. It is huge and well stocked so we managed to get everything we needed. We met a very nice couple from FL who tie up their trawler at the marina for a month. Convenient we guess but no way we could stay more than a few days at a clip when there is some much more of the bahamas to see. 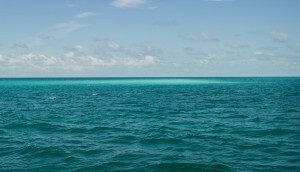 We left the marina at 1PM and were anchored outside of Hope Town, Elbow Cay behind Parrot Cays by 3PM. Hope Town is one of the most picturesque settlements in the Bahamas. 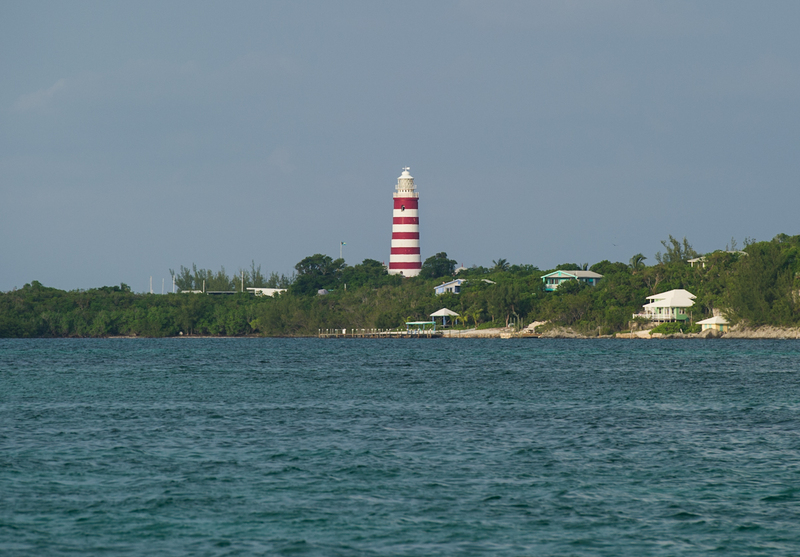 Its candy-striped lighthouse was built by the British Imperial Lighthouse Service in 1863. It still uses a kerosene fueled mantle and rotating glass fresnel lens that beams a light visible for up to 20 miles. The town was founded by loyalists in 1785. Hope Town provides two town docks to tie up and we took a long walk through town. The Hope Town Harbor Lodge is a beautiful, small, beach side resort that would fit the bill for any wedding. A wedding happened to be going on that night so all the golf carts were rented and we were not able to see as much of the island as we had hoped. Reason to return. 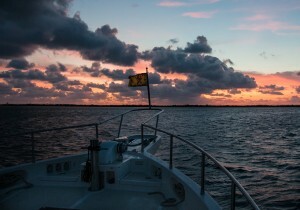 It was time to start heading back so from Elbow Cay we returned to Great Guana Cay. I had been monitoring the weather for a few days and knew that the wind had kicked to the northeast. This meant a potentially rough passage through “The Whale”. We were able to pick up the weather report from the Green Turtle Club and a boat had mentioned that the passage was rough. We left Great Guana at 10AM and hit the whale and hour later. 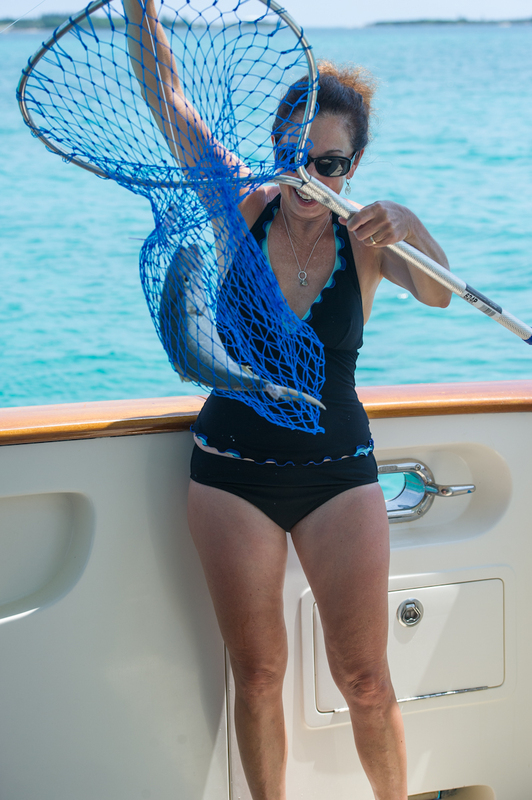 It was rough but “Big Smile” handled it well and we dropped the hook at Manjack Cay just after noon. 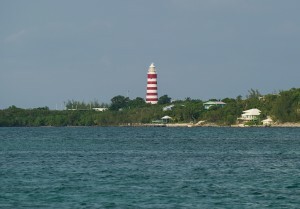 Manjack is a small Cay with several homes. The chart showed a mangrove creek near the anchorage. We launched the kayaks and spent two hours kayaking the shallows and found a small beach on the Atlantic side with good snorkeling. We now had a major decision to make. The weather for the next several days was not looking good. A tropical storm was brewing in the Gulf of Mexico and the winds had shifted to the north creating potentially hazardous gulf stream crossing conditions. Weather models and the forecasts I was receiving from my weather forecaster Chris Parker showed a potential crossing for Tuesday with deteriorating conditions beyond. We elected to make a 70 plus mile run to Mangrove Cay on Monday leaving us a 95 mile run from Mangrove to Ft Pierce over the White Sand Ridge of Little Bahama Bank. The run to Mangrove Cay was beautiful with a following sea. 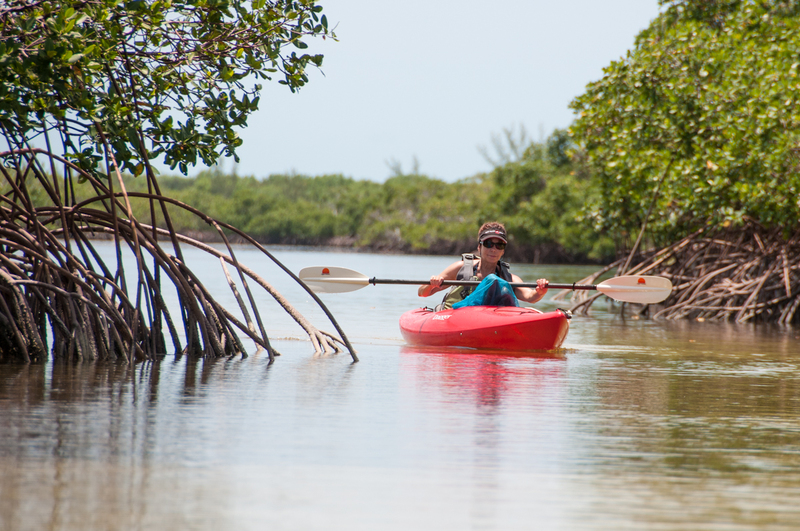 Mangrove provides little wind protection but it does eliminate the fetch of an east wind. We weighed anchor at 6:30 AM. 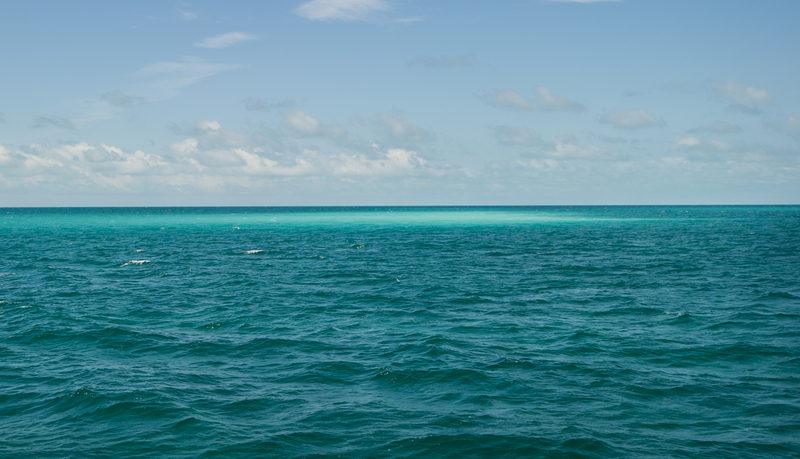 Crossing the Little Bahama bank was uneventful and we saw only two boats in the first six hours. The last weather report we had heard called for ENE winds 15+ with seas 4-6 feet up to 8′. We left the Bank and its 20 feet of water and entered the Atlantic. Seas immediately built to the forecasted 6′. Our course to Ft Pierce had the seas too much on the beam so we altered 10 degrees to the south. I figured that would be a better ride through the gulf stream and once through we could start to head north. It worked and we had only one large wave push us more than I liked. The stabilizers performed flawlessly and the autopilot held course for the 12 hour 15 minute crossing. My last concern approaching FT Pierce was the entrance itself. The wind had been blowing strong from the ENE all day. Fortunately the tide was coming in and we raced though the channel at over 12 knots. By 7PM we were comfortably in our slip at Harbour Isle Marina. It was a successful shakedown cruise but of course way too short. We spent two days cleaning the boat and packed the truck for the return to “ugh” New Jersey.